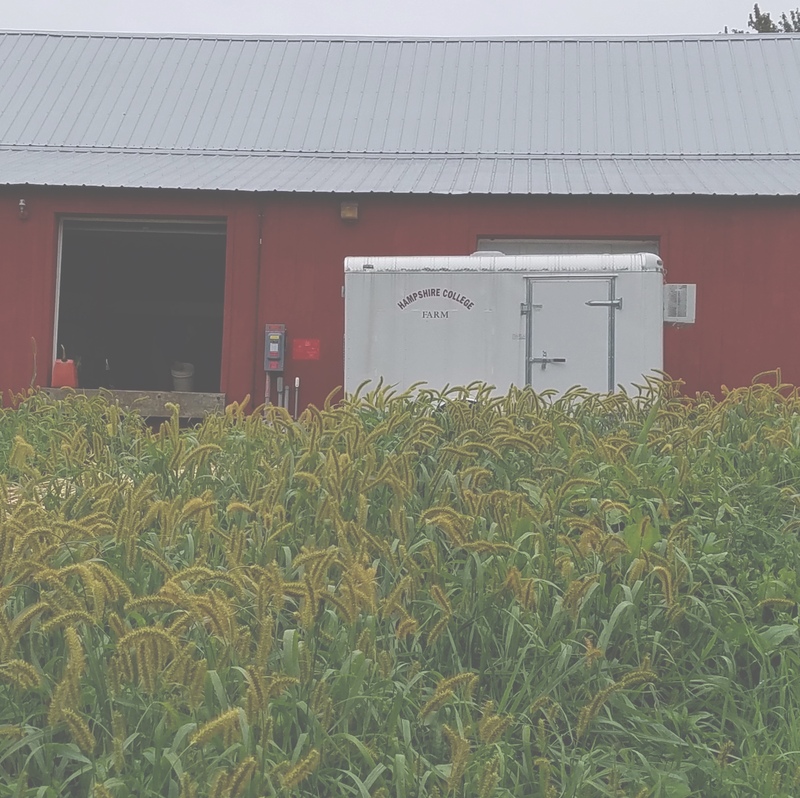 October is the time when blogging along with the CSA gets tricky. I look at the list that Farmer Nancy puts out on Facebook (Sweet potatoes, rutabagas, bok choy, tat soi, broccoli raab, cabbage, kale, collards, chard, mustard greens, broccoli and cauliflower, hot peppers, peppers, green tomatoes, beets, turnips, kohlrabi, radishes, garlic, delicata, jester, sweet dumpling squash, and carrots) and wonder whether I can possibly make a mustard green-green tomato-kohlrabi-sweet potato casserole, or some such, just to use as many vegetables as possible. Alas, no. Each week, it’s a choice. Not just green vegetables or orange, but exactly which type of green vegetable–the Chinese greens, the cooking greens, the greens related to cabbage or the greens related to beets. For this week, at least, I solved the color problem by going both green and orange, though I still had to choose which type of green. I also chose, one more time, to roast my vegetables. I don’t want you to think that roasting is the only option for the lovely vegetables of fall. But it certainly is a good option, and an easy option, and an option which gives you, well, other options. 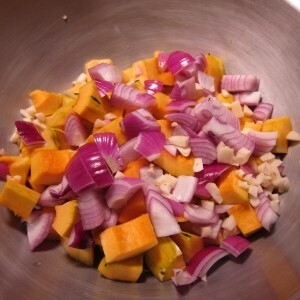 I used these roasted vegetables in a pasta dish, but you could easily use them as the base for a salad or eat them with another grain or eat them by themselves just because they’re good. I found this recipe in the cookbook The Splendid Table’s How to Eat Supper written by the wonderful Lynne Rosetto Kasper. Kasper is the author of a number of cookbooks about Italian cooking, including The Italian Country Table, sadly now out of print. (If you take out the copy from the Jones Library in Amherst and see tomato stains on it, those are probably from me.) She is also the host of the public radio show The Splendid Table. Not only is there a radio show and a podcast version, there is also a very useful website with lots of recipes on it as well as a weekly newsletter which delivers recipes directly to your inbox. I’ve been making this pasta dish pretty much ever since I first read the recipe. I made it the night Barack Obama was first elected to the presidency, and I’m still making it five years later, well into his second term and first government shutdown. I would not necessarily call this a quick dish. One of my quibbles with the recipe as written is that Kasper says that the prep takes 10 minutes. 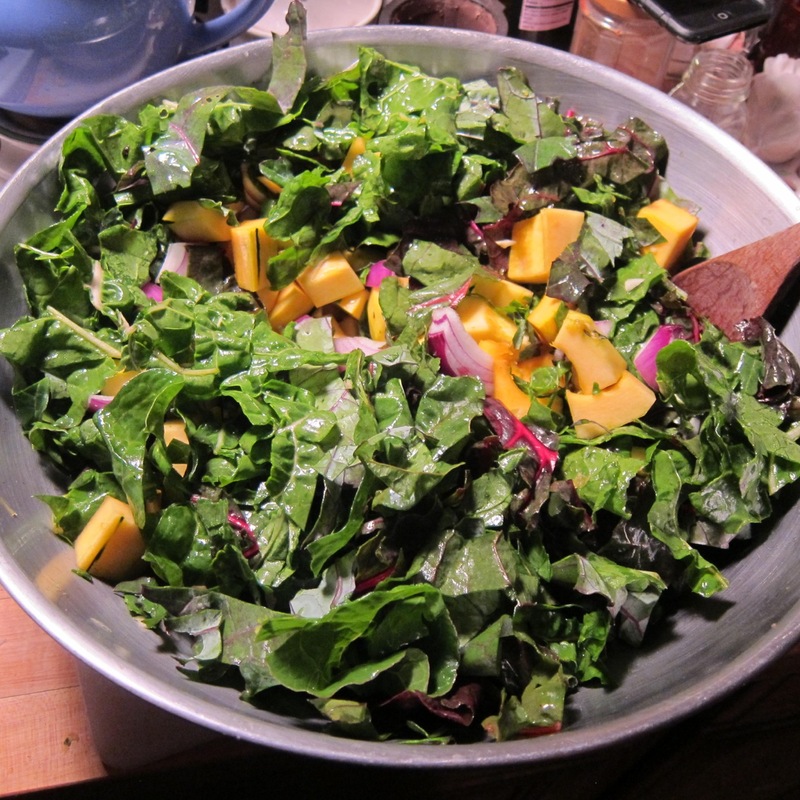 I am sad to have to say this, but the prep for this dish doesn’t take 10 minutes, and I can’t actually imagine how it could possibly take 10 minutes, when peeling and chopping winter squash is part of the prep, not to mention rinsing and chopping greens. What I will say is that you can do the prep in a fairly orderly fashion. One requirement for roasting the vegetables is that you need to put your baking dish in the oven while it preheats. There is your chopping time right there, while the oven and pan are preheating. Once the vegetables are in the oven, you can put your pasta water on to boil. Pretty much as soon as the vegetables are done roasting and the pasta is done cooking, you can combine them and your dinner will be ready. So, the prep isn’t arduous; it’s just not 10 minutes. I can live with that. I would advise using your biggest bowl, because it is rather a lot of vegetables. Plus, you will need room to toss them with your herbs and olive oil. And it will continue to look like a lot of vegetables once you spread them on the hot tray. But all of those greens will shrink down to tasty green bits in and around your squash, and the amounts won’t look quite so voluminous once everything has been roasted and then briefly broiled in the oven. Still, I should note that this full recipe makes a lot of pasta. Really, like a lot. So, good for dinner for 6 people (and some leftover), less good for 1 or 2 people who don’t want to be eating this every day for a week. 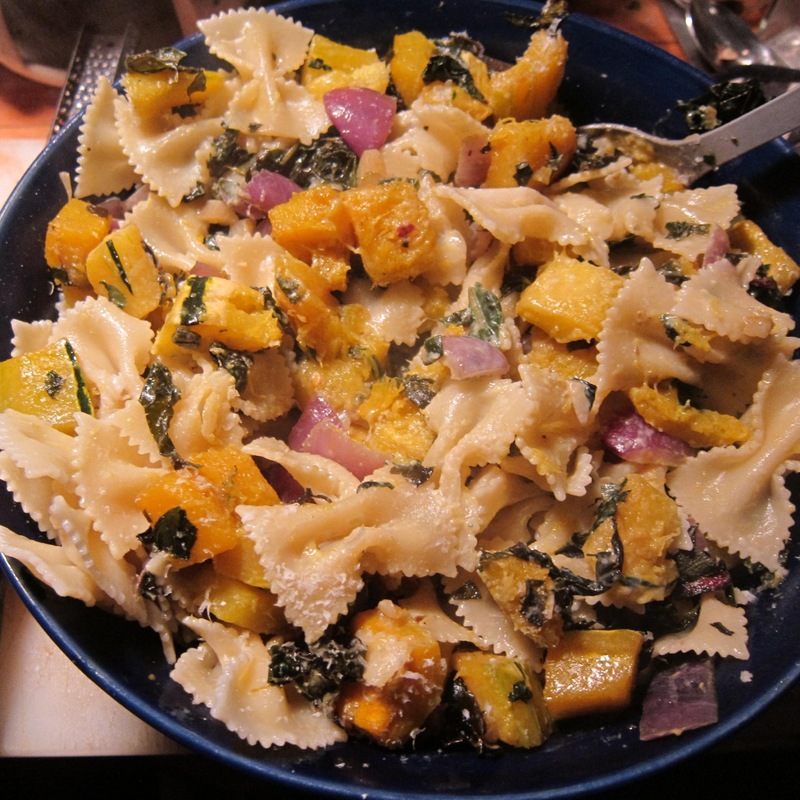 When I made this with my CSA vegetables, I used 3 delicata squash, my 8 leaf allotment of chard and kale (probably 5 leaves of chard and 3 of kale) and about 3/4 pound of pasta. (I didn’t fiddle much with the rest of the amounts.) That was still enough for 5-6 meals for people who are hungry but not starving. Sometimes leftovers can feel onerous, but with pasta this yummy, I don’t mind at all. Slip one large or two smaller shallow sheet pans into the oven. Preheat the oven to 450°F. Start to prepare your vegetables, peeling, seeding and chopping the squash, washing and chopping the greens, etc. Pull out the oven rack holding the sheet pan. 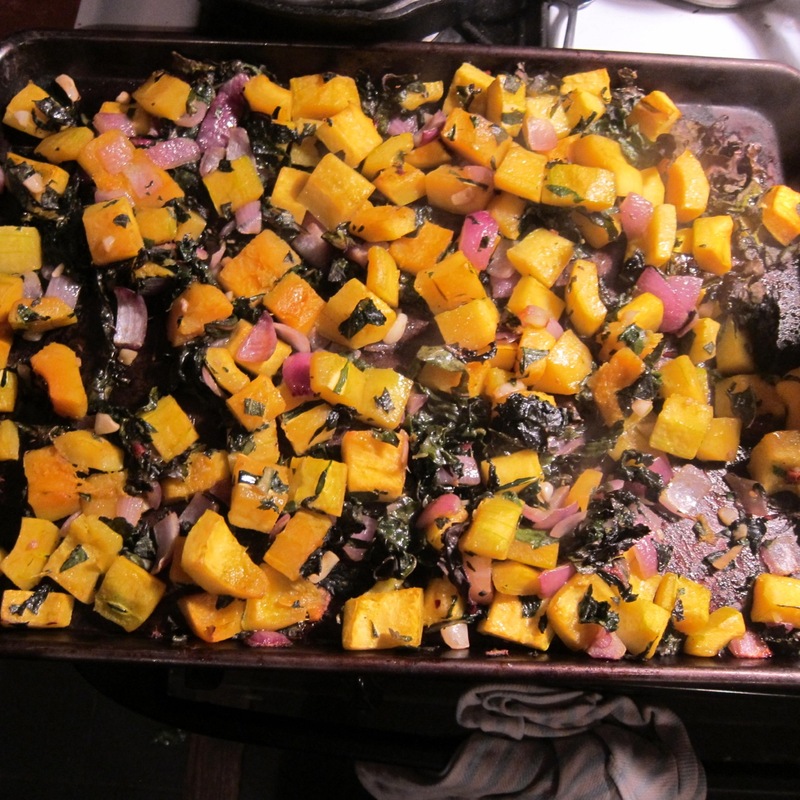 Taking care not to burn yourself, turn the squash blend onto the hot sheet pan and spread it out. 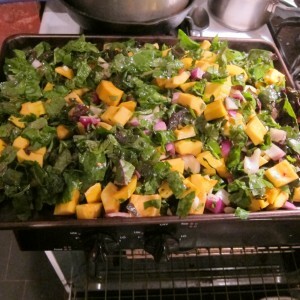 Bake for 25 minutes, or until the squash is tender, turning the vegetables two or three times during roasting. Meanwhile, bring the salted water to a boil.